Red velvet is truly one of my favourite flavours of cake. I’m not one to feel guilty to eat a piece of cake but sometimes, it’s better to break them down into smaller portions. Even better when you can cover it in candy coating and add some sprinkles. 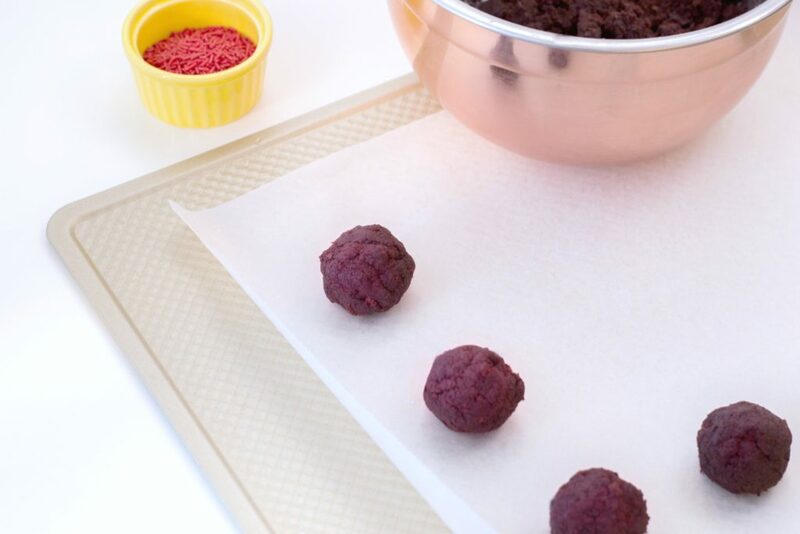 These red velvet truffles are perfect for a sweet little treat or as a gift for Valentine’s Day! 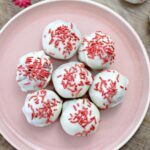 If you’re looking for more Valentine’s Day treats, consider trying these Poop Emoji Cupcakes, Keto Chocolate Covered Strawberry Fat Bombs, and keep an eye out for Valentine’s Day Rice Krispies Treats. Preheat oven to 350 degrees F. Coat two 9-inch circle pans with softened butter then coat it with flour. Set aside. 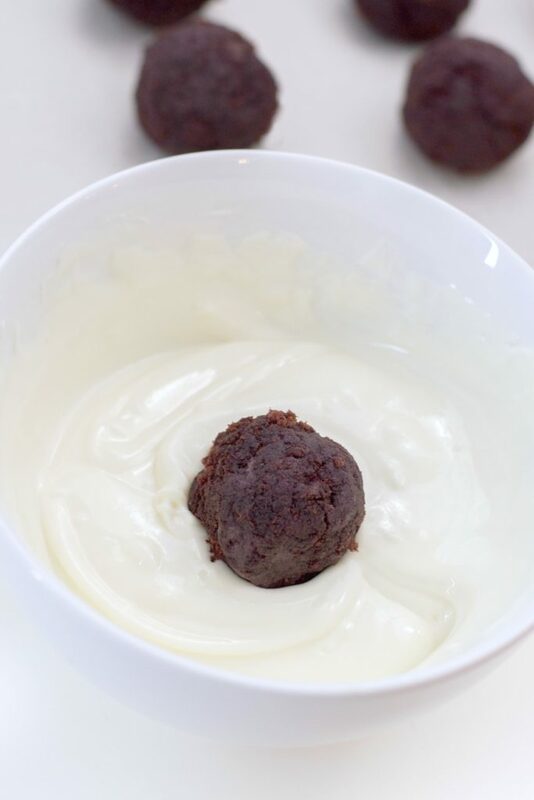 In a bowl, mix together chocolate cake mix, buttermilk, oil, and eggs. Continue mixing until all ingredients are combined. Add cocoa powder and continue mixing. 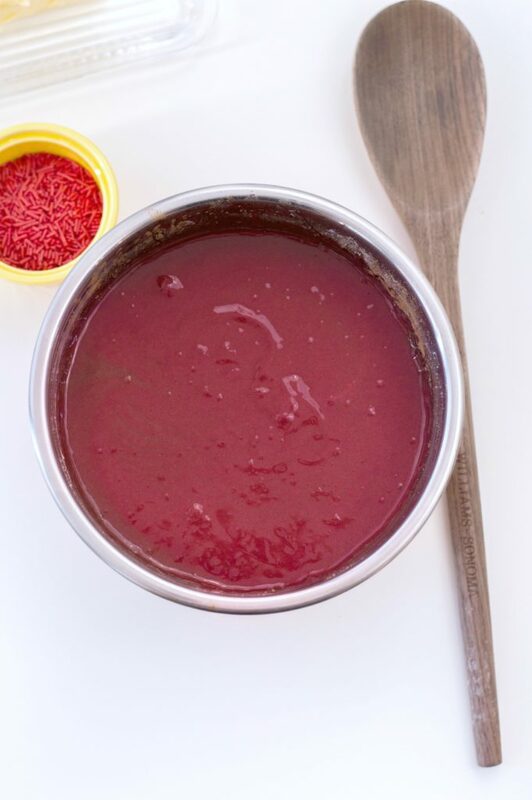 Then, add red gel food coloring and continue mixing. Pour batter into each pan and bake for 25-28 minutes. Remove from pan and allow for the cakes to cool on a wire rack. Line a baking sheet with wax paper and set aside. In a large bowl, crumble your cake into fine bits. Then, add vanilla frosting and mix (you’ll have to get messy and use your hands for this). Roll the cake into spheres about 1 to 1.5 inches in size. Place gently on a lined baking sheet and refrigerate for 30 minutes. Dip each sphere into the melted chocolate and coat completely. 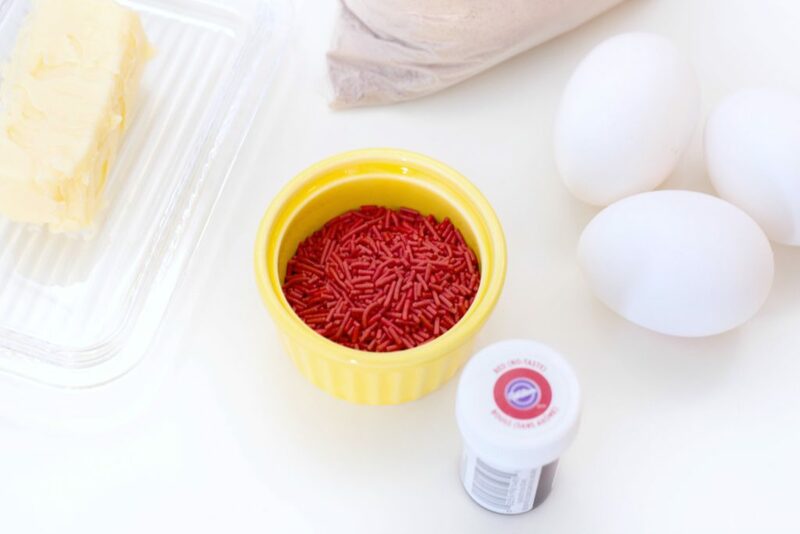 Place back onto lined sheet and top with red sprinkles. Place back into the refrigerator for another 20 to 30 minutes and serve. Enjoy! 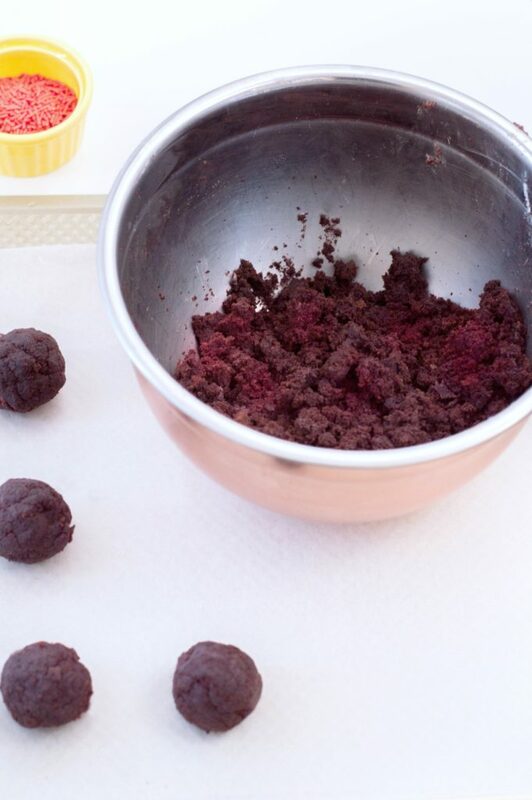 Try these delicious and festive red velvet truffles. Perfect to satisfy any sweet tooth and to enjoy during Valentine's Day or any time of the year! Place back into the refrigerator for another 20 to 30 minutes and serve. Enjoy! There really is nothing like red velvet and in truffle form, it makes for the perfect bite. Need some Valentine’s Day treat ideas? Try these Poop Emoji Cupcakes. I’ll be sharing Valentine’s Day Rice Krispies Treats, or Keto Chocolate Covered Strawberry Fat Bombs over the next couple days so keep an eye out! We have made these types of truffles many times and used different colors to dip them in. Work for all holidays just changing the type of cake you use and the dipping chocolate. 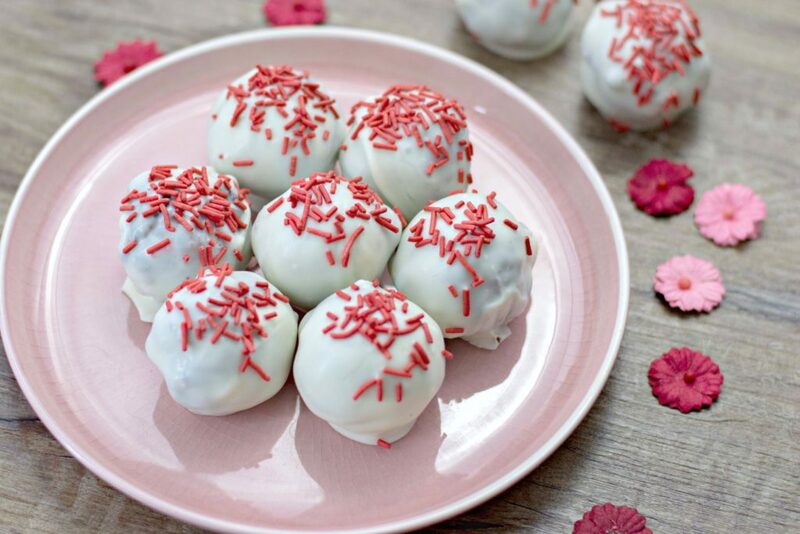 you are speaking my love language over here girl- i love anything red velvet but these little truffles are PERFECT to take with on the go or just a few after dinner 😉 Cant wait to make these! Easy is one of my favorite words but when you say super easy I am even more happy. This would be a nice treat to get everybody at my kiddos school. They would love it and I love that won’t take me long to do. 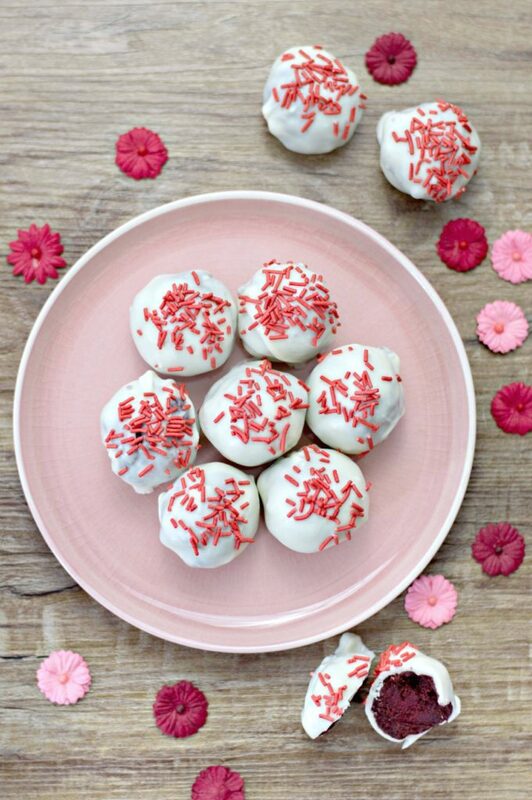 THese look like the perfect valentine’s Day holiday treat to make for my kiddos. I wonder if the school would let me bring these as a treat. Always ask them before, I think that is the safe bet. Now these sound absolutely delicious. I mean who doesn’t love a good truffle and I love the idea they use red velvet as well. Ooo these look incredible! I’m pretty sure I’d be a fan. I’ve always liked red velvet treats. Yes, they are soo good. 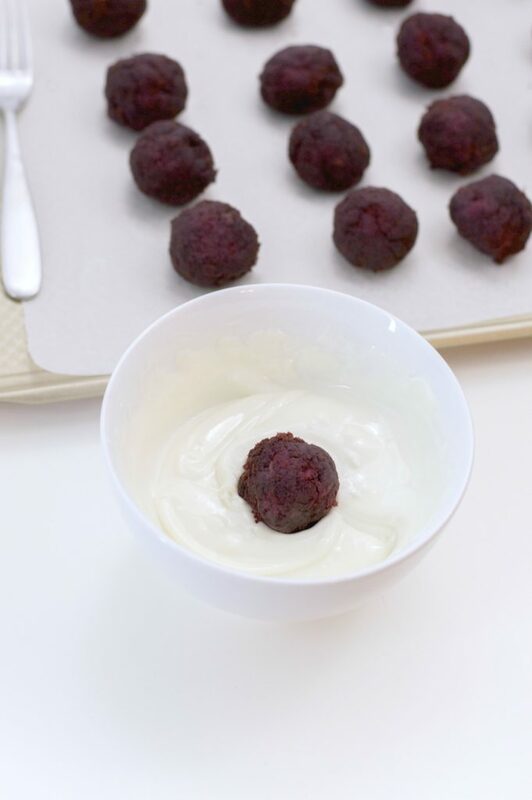 Wow, these truffles seem super easy indeed and look beyond delicious! I may have to surprise my kids with them as a fun Valentine’s Day treat. Awww, hope they loved the surprise. 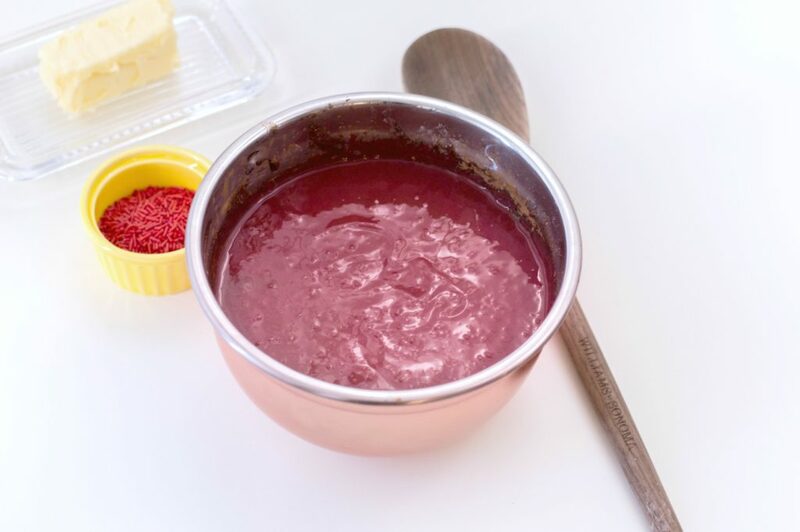 Red veelvet is one of my favorite dessert flavors. Looking forward to giving this recipe a try. These are perfect for Valentine’s Day! They look irresistible. I am loving all of the red velvet recipes coming out for Valentine’s Day. My son loves anything red velvet. Awww, he will love this! These look so delicious and would be perfect for Valentine’s Day! I’ll have to make some with my girls next week! Oh my gosh! I want some! These just look super delish! I am a big fan of red velvet too! I’ve made truffles before, but I did it with a cake pop maker. Then when I moved I ended up selling the cake pop maker. Now I wish I still had them. These are so good! Hope you give them a try. I’ll take a dozen please! So fun and festive for the holiday! You make it look so easy! 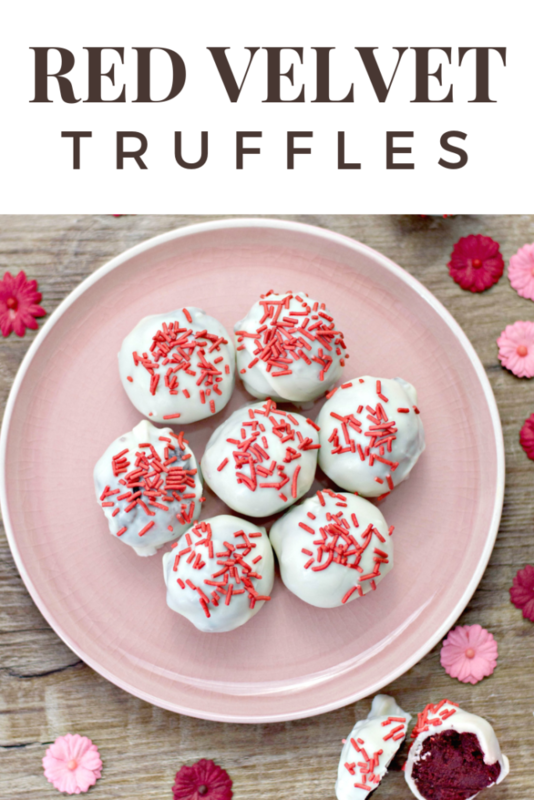 These truffles are so easy to make and perfect as a Valentine’s Day treat. We’ll have fun making them next weekend. I am sure my son will enjoy helping me! Awesome, I hope he likes it. These look so delicious. I can’t wait to make these with my kids. They love making treats like these. They’re just gonna love this! Awesome, hope they like it. Yum. I love these. I think they would be so fun to send to school or to bring into work. 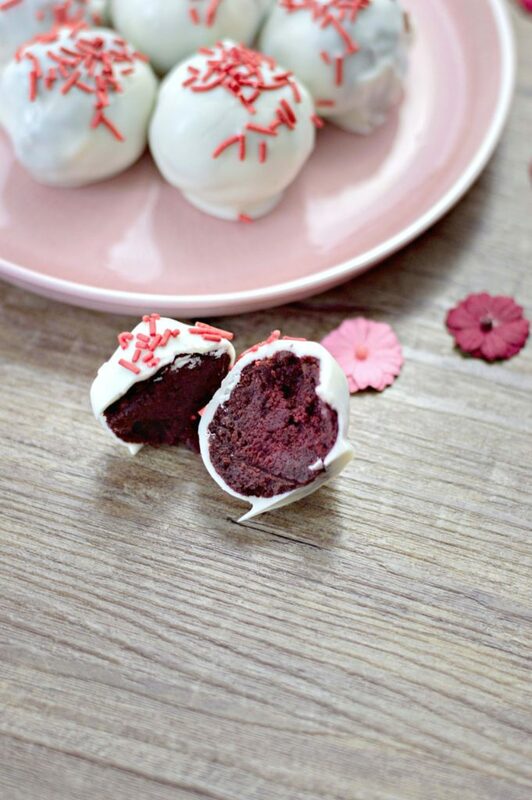 These are delicious red velvet truffles I need to make some for valentine day. your recipe is so easy. This is such a great recipe even the kids can do they will loved it and a great time to spent together. Awww, that is awesome. I agree.